Tonight’s episode of The Vampire Diaries was called ‘Heart of Darkness.’ On tonight’s episode and the countdown to the finale Tyler finally returns to Mystic Falls but he gets more than he bargained for when he suspects that Klaus has a thing for Caroline. Elena and Damon set off together to make sure Jeremy is safe in Denver, and to see if his special abilities can help reveal the information they need about ancient vampire bloodlines. It doesn’t take them long to learn that Jeremy has been hanging with the wrong people. It seems Jeremy’s best friend is Cole one of the originals. The best part of tonight was a major Elena and Damon smooch! Lots happened tonight – it was nice to see Tyler and Jeremy back. If you missed the episode you can read our full recap here! There are only a few episodes left so don’t miss anything! On the next episode ‘Do Not Go Gentle’ Alaric finds an unexpected ally to guide him on his dangerous new path, while Damon and Meredith try to figure out what their next move should be. 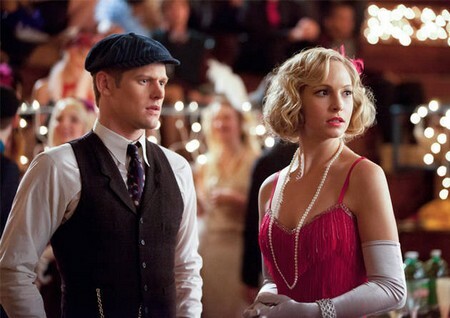 At the school’s 1920s Decade Dance, Bonnie asks Jamie to go with her and, at Caroline’s suggestion, Elena asks Stefan to be her date. 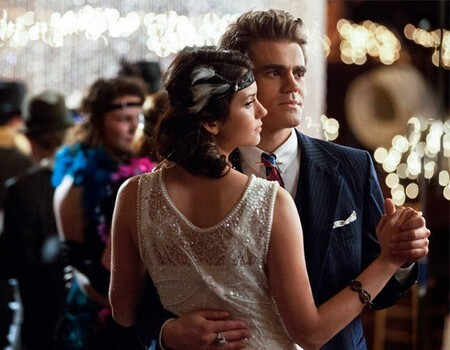 Caroline is pleasantly surprised when Tyler shows up at the dance determined to sweep her off her feet, but Klaus does his best to come between them. 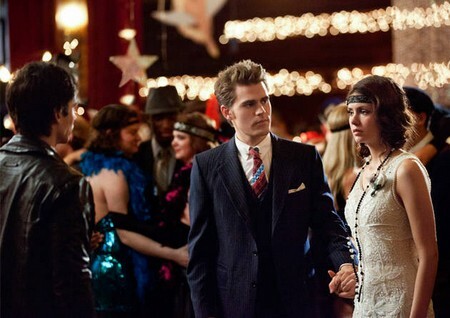 The dance takes a deadly turn when Damon and Stefan realize they need the help of Matt, Jeremy, and especially Bonnie to undo a spell that could prove devastating for everyone. From the preview for next week we see Rebekkah telling Alaric that she has big plans for the night. They are going to a dance, remember after tonight’s episode we know Rebekkah is not herself anymore Esther, her mother has taken over her body. Across the screen: “the perfect night, for the perfect trap.” Damon and Stefan head to the dance but cannot get in there is a boundary spell and they are trapped. In one of the last scenes Alaric is saying to Elena: “You think I am not myself, but this is who I really am.’ Elena is looking very distressed. Check out the video there is a lot more! ’Do Not Go Gentle airs on the CW on April 26th, 2012. Check out the preview video and the pictures below below and let us know in the comments below what you think!